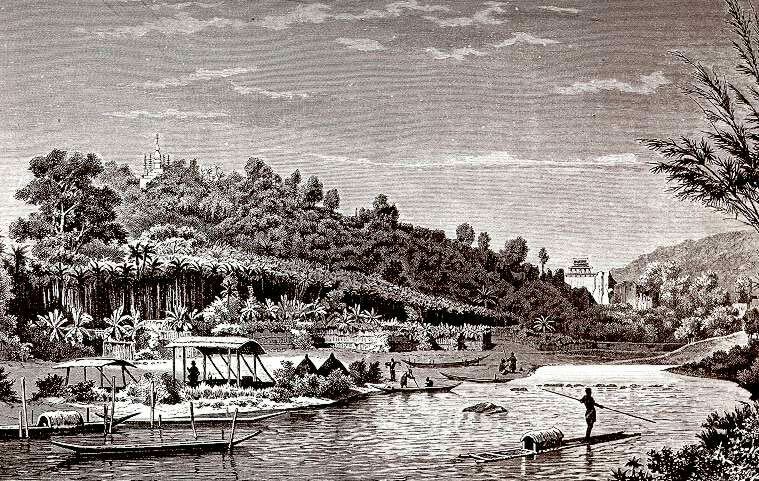 Phousi Hill, with the stupa That Chomsi dominating all Luang Prabang. 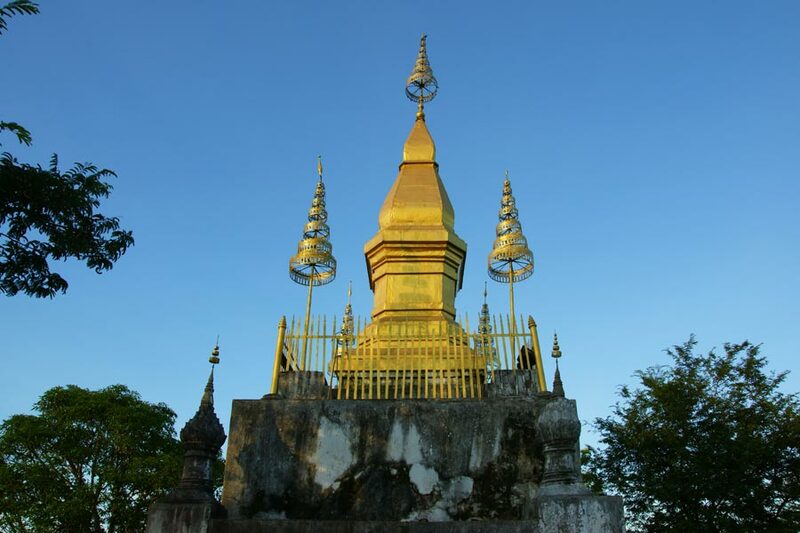 Built in 1804 during the reign of King Anourouth and ideally located at the top of Mount Phousi (in the heart of the town), Wat That Chomsi has become a symbol of Luang Prabang’s spiritual significance to Laos. 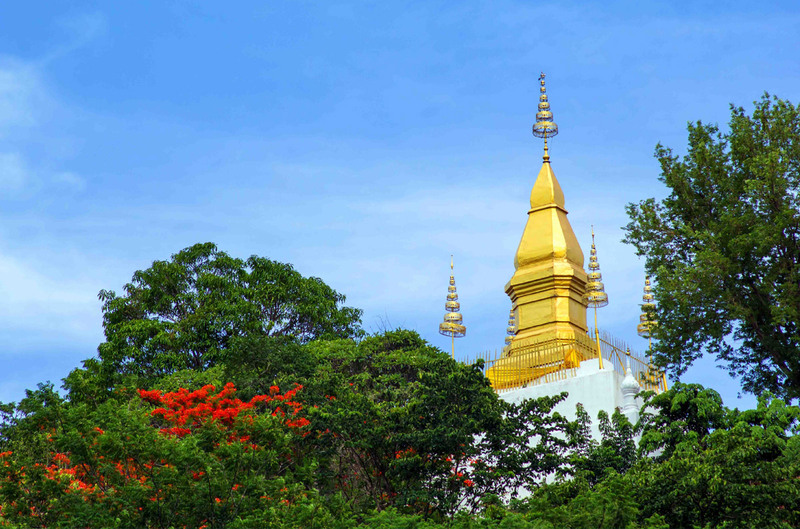 The Stupa is reachable after climbing the 300 steps when all the way up the hill consists of various temples, beautiful shady trees and a magnificent view of the river. 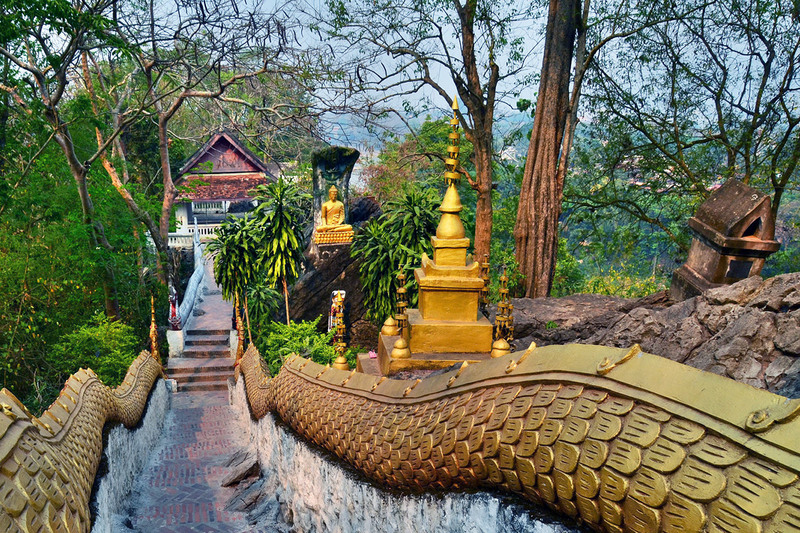 At half way up the hill there is Wat Tham Phousi Shrine that consists of a big–bellied Buddha snuggled in a grotto. The temple also consists of another Buddha statue in a reclining position. 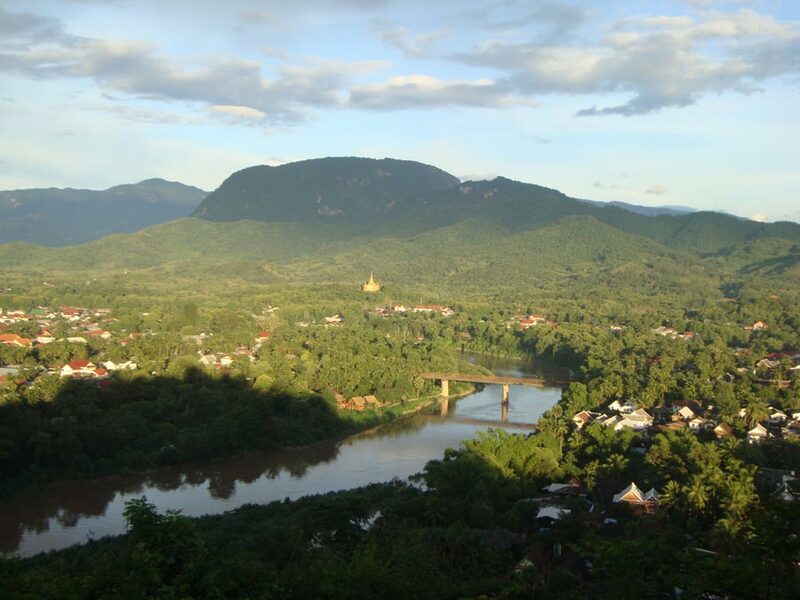 A terrace at the foot of the stupa offers an 360° panoramic view of the town. A MUST DO, especially in the evening, during the sunset, when the golden Stupa reflects the last light rays on one of its face. During the Pimai Festival, woman carry flower offerings up the stairs and leave as offerings at the foot of the stupa. 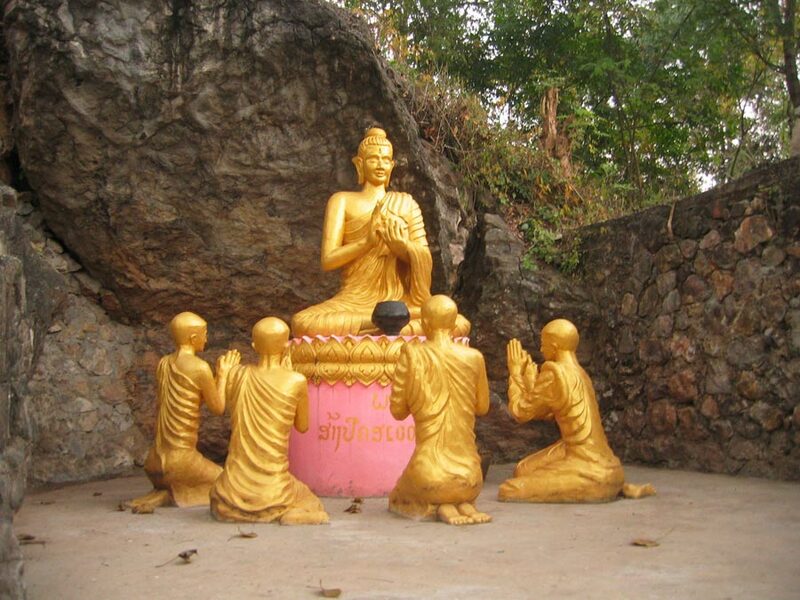 One of the most interesting aspects of Mount Phousi lies in the legend which surrounds it. 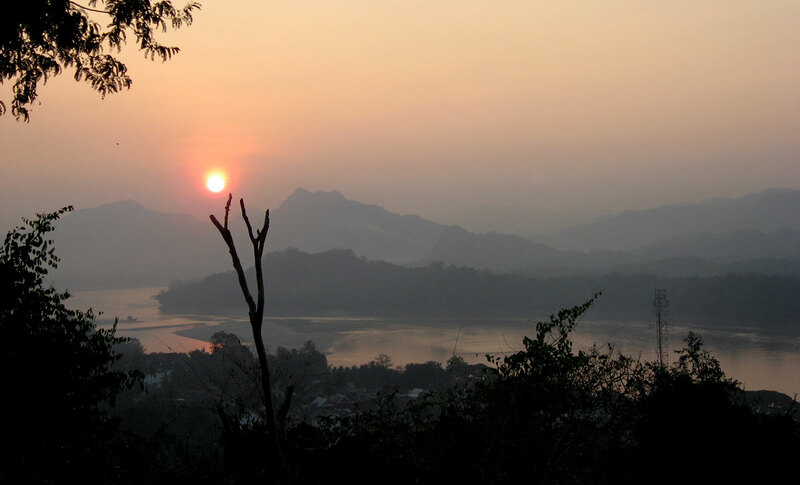 Tradition has it that at the site of the sacred hill there used to be a deep pit that led to the centre of the earth. Helped by villagers, a monk went down into the pit and found an immense treasure. The villagers seized the treasure and buried the monk alive by sealing the entrance to the pit. However, armed with magical charms, the monk succeeded in extricating himself after defeating the seven guardians of the treasure. 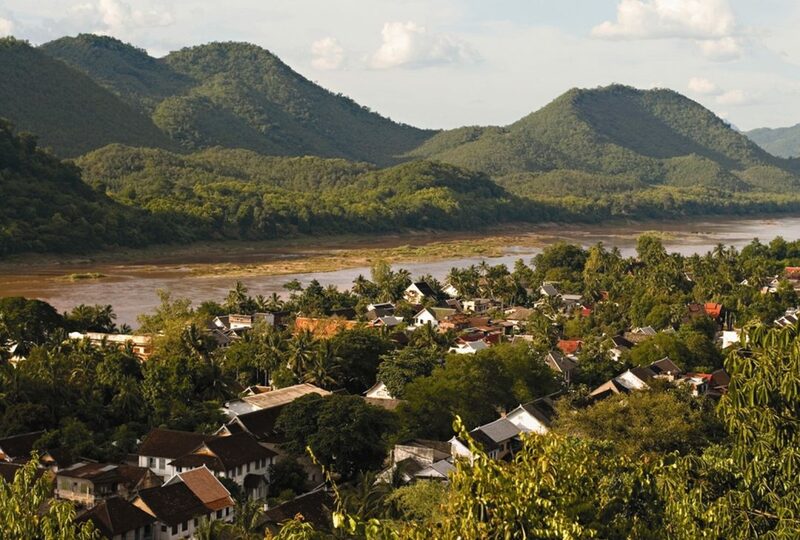 News of this murder attempt reached the ears of the king of Luang Prabang, who punished the villagers by condemning them to take turns in beating drums, gongs and cymbals every three hours to stop the dragons from disturbing mankind. 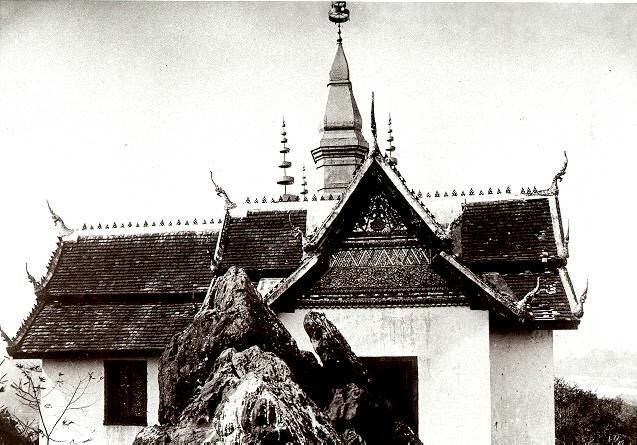 This practice is still carried out today at nearby Wat Thum Thao.